Elvira actually belongs to the shelter I’m volunteering at. She is a grumpy, middle-age, chubby chihuahua, who snaps at anybody and anything that happens to pass by her kennel. It is no wonder that she has been there for such a long time without anybody wanting to adopt her even with her striking and beautiful black and white marking (hence the name), and the staff was looking for somebody to foster her in the hope that more comfortable and personal environment may help her become ｆriendlier and more adoptable. And somehow she ended up with me and my guys. Despite rejection and fierce resistance I was fully prepared for, Elvira turned out to be the sweetest little lady who wants nothing but cuddle all the time. She is also a loyal friend who takes her responsibility of protecting me from squirrels and household appliances that make loud noise very seriously (the battle between her and my steam mop is an EPIC). For her birthday, I thought I would make something that shows off her true nature – something black and white and sweet… And What could be more perfect than whoopie pies! GREAT idea, right? A minor issue, however. 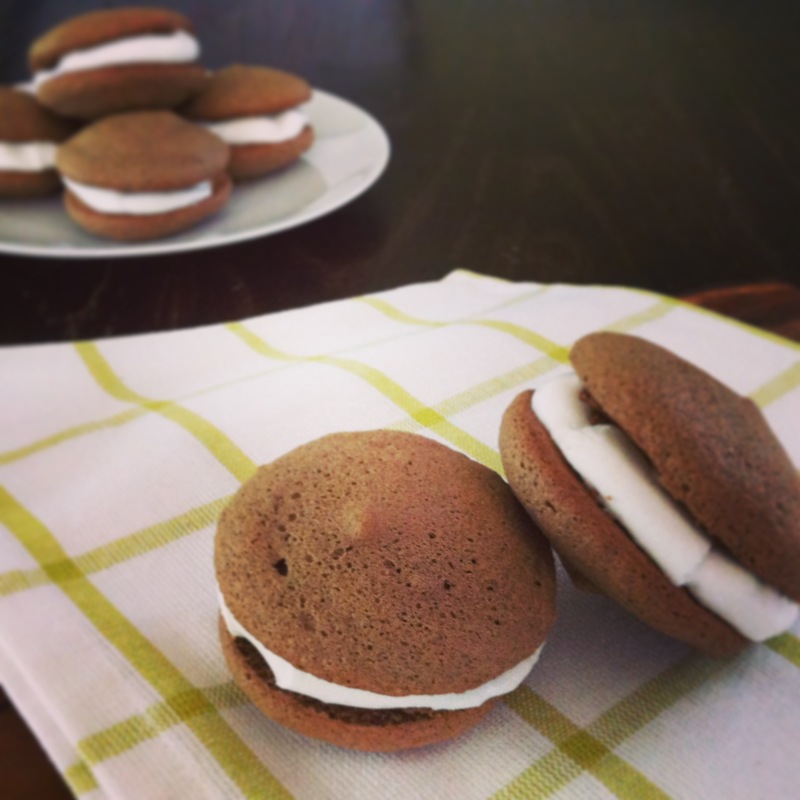 I did overlook the fact that I’ve never made whoopie pies before. Luckily, one of the few things I can bake and is relatively well received is bouchée, a delicate and airy pastry patty I usually serve with fresh strawberry and cream as filling. My version of “whoopie pie” is a slight modification of bouchée, and there is only one thing you need to remember to succeed: Meringue. I know most of you are probably much more advanced baker than I am, but if you are not and reading this, please, just make sure there is no water or oil on your bowl or a mixer, and whisk like you’ve never whisked before. Until those shiny little peaks are formed. If you can make perfect meringue, then you are pretty much done making these yummy treats. The bonus for those who are still staying on course for New Year’s resolution is that these are very light. No butter or oil is used. One egg can make 6-8 shells/3-4 pies, which are lightly crisp to bite on outside but soft and fluffy inside, going so incredibly well with marshmallows that get toasted and melty on top of flipped patties for an extra few minutes. And did you know – Marshmallows are FAT-FREE? I must say my baking concept has never come together so well. Maybe 2013 is the year of baking! NOTE: Chocolate is toxic to dogs so these are NOT for them – I brought these to the shelter to share with fellow humans. Your pups will be happy enough with jerky and bacon bits. Preheat oven to 360 degrees F. Line a baking sheet with parchment paper. Combine flour, cocoa and baking powder in one bowl. 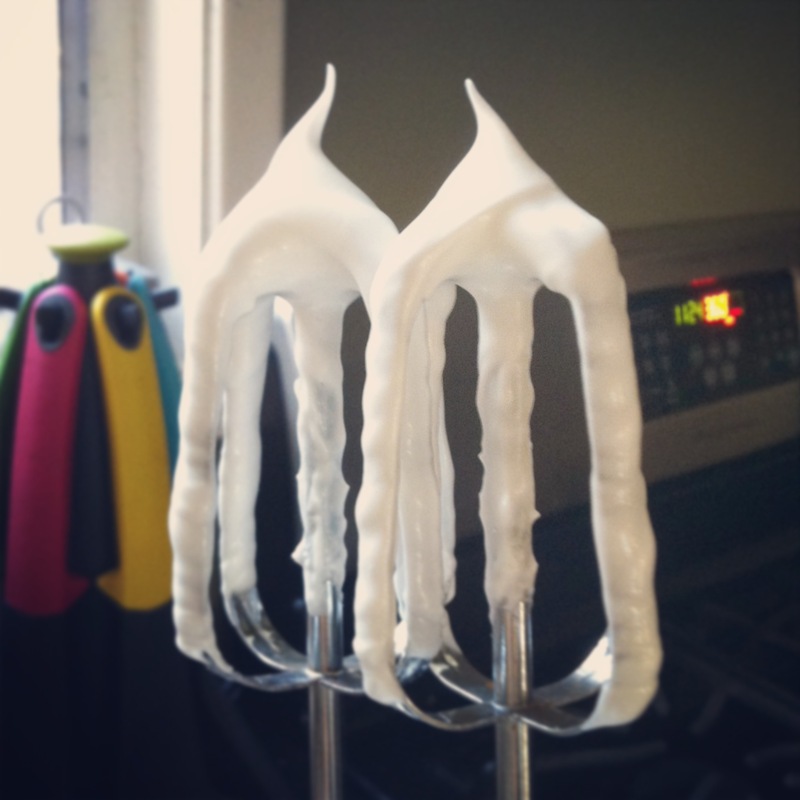 Using an electric mixer, beat egg whites in another bowl until foamy. Add sugar in a few batches while continue beating until the meringue is shiny and forms a stiff peak when you lift the mixer. Add egg yolks into the meringue and gently mix with an electric mixer, until they are completely blended. Sift together flour, cocoa and baking powder into the egg mixture and fold them gently with a wooden spoon or rubber spatula. Stop as soon as all dry ingredients are mixed (don’t over-mix!). Drop about a tablespoon of batter onto parchment paper, forming a round mound that is about 2.5 in diameter and 0.5 in height, and 2 inches apart. ** Bake in the oven for 13-15 minutes. Remove from the oven and set aside half of patties on a cooling rack. Turn the remaining patties over and place a marshmallow on top of each, then return to the oven for 2-3 minutes until the marshmallows are softened. Remove them from the oven, press the patties set aside earlier on top of each. ** The batter is much softer and runnier than, say, cookie dough – Feel free to use whoopie pie pan or pipe them onto the baking sheet if you would like. I don’t have the equipments and am OK with “hand-made” look of baked patties.